It's here, it's finally arrived! The ultimate waffle iron, a perfect fusion of practicality and style. It's the toilet-shaped waffle-iron! It'll revolutionise the way you think about waffles! "It's brilliant! Who'd have thought you could have so much fun with just a toilet shaped waffle iron? Not only does it cook waffles, it's also a fully functioning toilet, you know. It's revolutionised the way I cook!" Also impressed were the members of the National Waffle Ironing Club (NWIC) to which Mrs Butterworth belongs. So what are you waiting for? 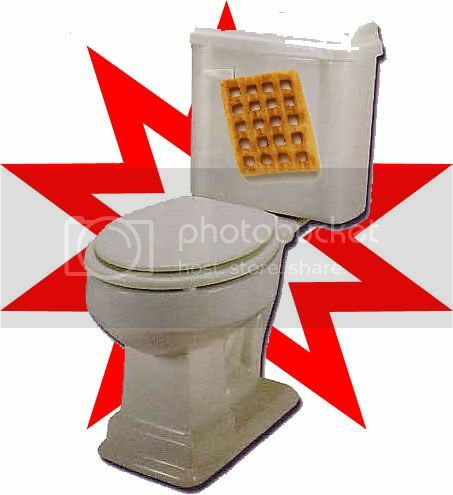 Head out and buy a a toilet shaped waffle iron today! It's so splendiferous, it'll make even the most boring of cooking tasks fun! Personally, I can't wait to masticate one of the toilet-shaped waffles. Can you?